Pleasant Valley Conservancy is part of a group of natural areas in southern Wisconsin that share five summer interns through the Madison Audubon Society. There are five organizations, called the Prairie Partners: The Prairie Enthusiasts (at its Mounds View site), Pleasant Valley Conservancy State Natural Areas (which also includes some work at Black Earth Rettenmund Prairie State Natural Area), Pheasant Branch Conservancy (Middleton), UW-Madison Lakeshore Nature Preserve, and the Goose Pond Sanctuary of the Madison Audubon Society. The five interns work as a team, and spend one day each week at each of the five sites. The dates are from May 24 through August 13, 2010. This is a full-time program. This program is open to students at any college or university, although in the past most students have been at Wisconsin institutions. Last summer we had students from U.W. Stevens Point, U.W. LaCrosse, U.W. Madison, and Beloit College. Students must be able to live for the summer in the Madison Area. Availability of a car is desirable, since the students will be car pooling. This is an excellent opportunity for students interested in restoration ecology to get real "on-the-ground" experience. The five sites are quite varied in their character, and include high-quality prairie remnants, oak savannas, oak woodlands, and wetlands. The deadline for receipt of applications (by email attachment sent to the Madison Audubon Society office) is Friday March 4, 2010. Details of the program can be found at this link. If you have been following this blog, you know that for the past several years we have been constructing a tree database for Pleasant Valley Conservancy. We are permanently marking, measuring, and identifying each tree, and recording its position with GPS. The data are being visualized and analyzed using ArcGIS, which I have been working on (and slowly learning) for the past two years. I have been following the lead of the silviculture literature, especially the nice book on the ecology and silviculture of oaks by Paul Johnson et al. (a new 2nd edition is now out). Among other things, Johnson and his colleagues at the U.S. Forest Service have developed a quantitative method for characterizing an oak savanna. 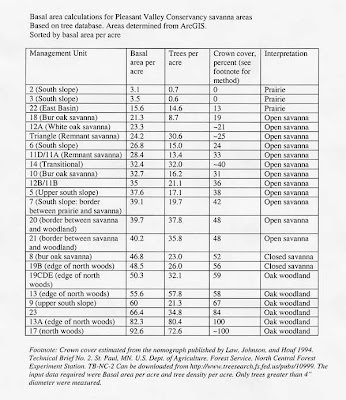 This requires an estimation of the basal area per acre and the tree density per acre for each stand. From these data, using nomographs they have constructed, one can calculate the percent crown cover for a site. The table below contains a summary of my calculations for the savanna, remnant prairie, and oak woodland areas of Pleasant Valley Conservancy. You need to use the Management Map provided on my web site to see exactly where each unit is, but I have added information in the table that should help even without the map. Constructing this table turned out to be an all day job (perfect for this really frigid weather), and I ended up with a huge Excel spreadsheet that had all the data organized by management unit. (We have over 2300 trees recorded, and we are not finished yet!) Once the data from this spreadsheet were compressed, I ended up with the compact table shown below. According to Johnson and colleagues, estimating crown cover can be used to monitor changes in an oak savanna with time. 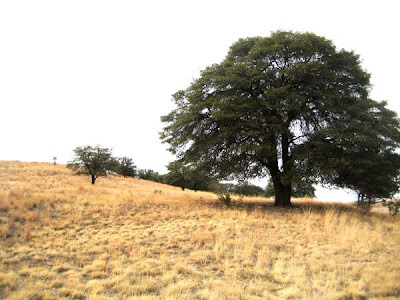 When restoring a savanna, the crown cover measurement on a savanna that has grown into a closed canopy stand can provide a baseline for use while following the restoration process. Thus, the crown cover provides a measure of the "state" of the savanna. My canopy measurements agree quite well with the more qualitative measurements of other savanna workers in Wisconsin. Note that you do NOT have to measure each tree to carry out this analysis. One can use sampling methods that foresters and plant ecologists have developed. Procedures for doing this are well described in the silviculture literature, and there are numerous textbook-like descriptions on web sites. However, we have lots of other uses for our tree database. There have been a few days lately when the weather brought about lots of large ice crystals on the vegetation at Pleasant Valley Conservancy. Sharp cold nights with early-morning fog seemed to be responsible. 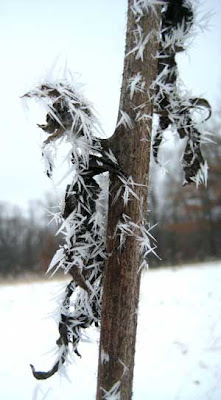 Some days it remained cold enough so the crystals hung on most of the day. 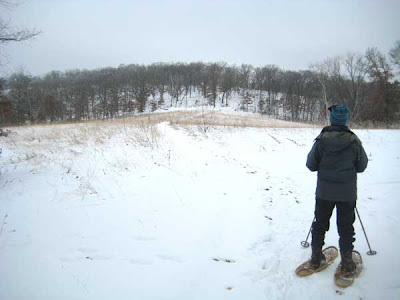 The photo above shows Kathie snowshoeing across Toby's Prairie. There were lots of flower stalks here loaded with crystals. Ice crystals were heavy on most of the remaining flower/seed stalks. In addition, they were really heavy on the compass plant stalks, as the photo here shows. These crystals hung on almost to noon, but then there was a brief sun in early afternoon which warmed things up enough so that all the crystals completely disappeared. Getting good pictures turned out to be somewhat of a challenge, since it was a cloudy day and the contrast between the crystals and the flower stems was not very great. Fortunately, Photoshop came to the rescue. This photo of the compass plant stalk has been "tweaked" by fiddling with the brightness and contrast controls. Another species that showed nice ice crystals was bottle brush grass, which was really loaded, causing the seed heads to droop quite a ways. Amanda, who has been working on our tree database this winter, has some nice ice crystal photos posted on her Facebook site. Take a look at them. It has taken me a while, but I have finally finished my summary of our trip to southeastern Arizona savanna areas. This is primarily a photo show, with captions and a bit of explanatory text. It was hard for me to believe how extensive the oak savanna areas were in southern Arizona. This is part of the state that features "sky islands", which are mountain ranges separated from each other by desert shrubland or grassland. All of these areas are relatively accessible by auto. Although we rented a four-wheel drive SUV, we could have reached most of the areas in a conventional auto. About 1/3 of the roads were good wide gravel and the rest were paved. Most of these savannas are in the Coronado National Forest, a huge area in southern Arizona whose headquarters are in Tucson. Prescribed burning is carried out, but most of the burns we read about were wildfires, some of vast extent, generally caused by humans. Although the "culprit" is never caught, most people in the area assume that these fires are caused by illegal immigrants (the Mexican border is not far away). We saw Border Patrol vehicles everywhere, even on some of the remote gravel roads were traveled. My report can be reached from this link, which is part of my web site on oak savanna restoration. The photos have all been edited in Photoshop so that the download time is relatively rapid. With a broadband connection, the whole report downloaded to my computer in about 10 seconds. The photo below shows a typical area of open-grown Emory oaks at around 5000 altitude near Greaterville, Arizona. If you use Google Earth, you can search for this town and bring up a fairly high resolution air photo of the area. Now that we are back from Arizona, and the weather is not good for the kind of brush work we need to do at Pleasant Valley Conservancy, I am spending my time doing background reading on oak savannas. Mainly I am reading some of what might called "ephemeral" literature, since it is not published in regular journals. A lot of this is U.S. Forest Service work that gets published in their General Technical Reports, of which a huge batch can be found on the 4th floor of Steenbock Library. Fortunately, all of these publications are indexed in MadCat, and will come up if you do a keyword search. Google Scholar is another source, although once you make a "hit" you generally only get to read the abstract. A far better way of searching is to use JSTOR, the Scholarly Journal Archive which pulls together full text of a huge number of scholarly journals, including 53 botany titles and 71 ecology titles. These are complete runs, back in many cases to the 19th century, and you can search all of them or only one or two at a time. Those of us at the university have free access, but there should be a way for Prairie Enthusiasts and others see these. Another source, which is open to everyone, is the U.W. Digital Collections archive, which has, for instance, the full text of all of the North American Prairie Conferences. You can reach this Collection via Google, or you can access it directly from this link. The UWDC interface takes a little getting used to, but once you figure out how it works, you have access to a lot of important literature. For instance, all of the Transactions of the Wisconsin Academy of Sciences, Arts, and Letters are available full text and completely searchable. A lot of the early Wisconsin flora was published in this journal, and it goes all the way back to the 19th century. All of the Technical Publications of the DNR are also available through UWDC, including some important prairie publications by Henderson and Cochrane! During two weeks of driving over many gravel roads in southeastern Arizona, I have been seeing huge areas of oak savannas that are completely different from anything we have in the Midwest. Although we discuss the rarity of Midwest savannas, the southeastern Arizona savannas can hardly be considered "rare". I have no idea how many acres of savannas there are here, but it must be considered in the hundreds of thousands of acres. Of course, the oak species are completely different. The oaks in the image above are emory oaks (Quercus emoryi), one of the most common oaks of SE Arizona. 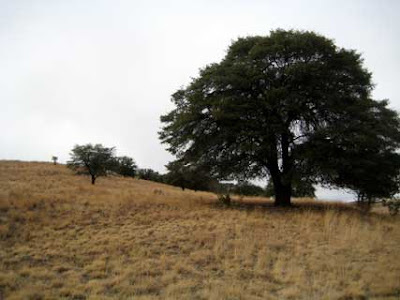 This species is found not only in open savanna, but other associations such as oak-juniper woodlands. It is one of the most common oaks in southwestern U.S., and provides a lot of wildlife benefits (its acorns are prized by deer). Emory oak is adapted to recurrent fire. Small trees killed by fire readily resprout and large trees survive fires of low severity. Unfortunately, this isn't the fire season, but there is plenty of information on the web about some of the larger wildfires that have occurred over the past decade. Fascinating area! This will be my last post from Arizona. Despite airline delays due to the Midwestern snow storms, I will hopefully be home by Friday. Too bad. I am just getting used to a climate where the sun shines all the time!